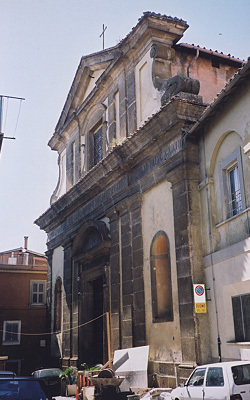 The town of Montecompatri is located five kilometres east of the town of Frascati. At the very top of the town is the parish church, Chiesa di Santa Maria Assunta. D. O. M. TEMPLUM QUOD DEIPARAE IN COELUM ASSUMPTAE DICATUM SCIPIO CARD. BURGHESIUS A FUNDAMENTIS EXCITAVIT ANNO MDCXXXIII MARCO ANTONIO BURGHESIO SULMONIS PRINCIPE PATRONO POSTULANTE HENRICUS EPISC. TUSC. S.R.E. VICE CANCELLARIUS CARD. DUX. EBORACEN. SOLEMNITUR CONSECRAVIT VII IDUS NOVEMBRIS ANNO DNI MDCCLXXIII TRANSLATAQUE ANNIVERSARIA EJUSDEM MEMORIA AD DOMINICAM TERTIAM NOVEMBRIS IPSUM EA DIE VISITANTIBUS INDULGENTIAM CONCESSIT CLEMENTE XIV PONT. MAX. For some years now the church has been closed. The bus which travels between Frascati and Rocca Priora stops in Montecompatri. It is a steep (and, depending on one's route, a complicated) walk up to the church. 1 I have not seen the inscription myself. It is recorded by Alessandro Atti, Il Cardinale Duca di York, Vescovo della Città e Diocesi di Frascati (Roma: Fratelli Pallotta, 1868), 39.